José Feliciano helps to save lives. He’s not a physician or a nurse, though. Instead, he’s the vice president of environmental services at Advocate Health Care. Although the environmental services team might not be as visible to patients as their caregivers, they play a critical role in preventive care. Due to their nature, hospitals have the potential to play host to the viruses and bacteria that patients seek treatment for. With those potential health threats entering hospital doors each and every day, the environmental services team is charged with maintaining a healthy, clean environment, which means doing everything from providing hand sanitizer to patients, visitors, and hospital staff to disposing of hazardous materials. “I don’t want patients to come in with one diagnosis and leave with another,” Feliciano says. To make his mission a reality, the environmental services team relies on Feliciano’s strategic, visionary leadership to create a healthy, clean, and safe caregiving environment at Advocate. In fact, helping his team members grow and develop is one particular point of pride for Feliciano. One method for helping others reach their full potential is leading by example. “I want people to say, ‘If José can do it, why can’t I?’” Feliciano says. In fact, Feliciano sees himself as a mentor and a role model for what others in the Hispanic community can achieve. After all, it wasn’t that long ago that he realized his own potential. In 1985, Feliciano was just a recent high school graduate with a passion for baseball. He played in a summer baseball league while working at a laundry plant for a local hospital. After a few years, it became clear that Feliciano had talents outside of baseball. In the field and at work, people looked up to him. He was a natural leader who, at the time, didn’t always recognize his own capabilities. When he finally did realize how much he could achieve, he quickly began to climb up the career ladder. “I knew that—if I could outwork you and outperform you—I would be recognized,” he says. By 1995, he was promoted to the director of environmental services at Columbus Children’s Hospital. At the Children’s Hospital of Columbus, Feliciano met one of his formative mentors—Robert Silver, the hospital’s vice president of support services. One day, Silver approached Feliciano and asked him where he saw his career going over the next few years. Feliciano replied that he was happy where he was, but Silver just shook his head. “He said that I needed to get a college degree because I could be something greater,” Feliciano says. “He said that I could too be a vice president.” Silver’s belief in Feliciano’s potential was highly motivating, and so Feliciano began to work toward a bachelor’s degree. While attending school, Feliciano worked a full-time job, carving out time to study on the weekends and late at night. On top of studying and working, he was also helping to raise a family. The long hours and often trying times, however, were more than worth it for Feliciano. “Receiving my degree was the greatest feeling of my life—outside of having a child,” Feliciano says. He says that having a bachelor’s degree significantly increased his career opportunities, but he didn’t want to stop there. He went on to receive an MBA from American InterContinental University when he was in his early thirties. 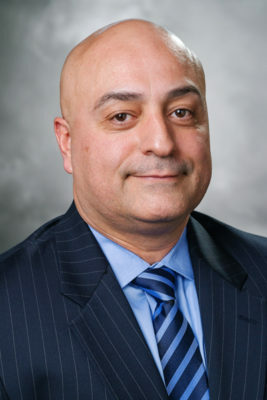 Soon after, recruiters started calling, and Feliciano received an offer to leave Ohio and work in California as senior general manager at Stanford Hospital & Clinics. In 2017, Feliciano joined Advocate Health Care, and the company is a perfect fit for Feliciano’s forward-thinking mentality. Advocate Health Care seeks to provide the best in world-class care. Diversity, equity, and inclusion are fundamental to realizing its mission. In fact, Feliciano has been impressed by Advocate Health Care’s progressive commitment to expanding opportunities to people of diverse backgrounds. “The timing is right, the culture is right, and the people are supportive,” he says. Recently, Feliciano attended a forum on behalf of Advocate, and it included a section on diversity in leadership, which Feliciano was asked to take part in with several other leaders. For him, it was an honor to take part in the forum because it provided him with a platform to share what diversity means to him. In that speech, he noted that he has not seen other Hispanic executives in roles like his. He went on to say how powerful it can be to have role models and mentors who reflect your own background, which is why he would like to inspire others in the Hispanic community to aspire for more.